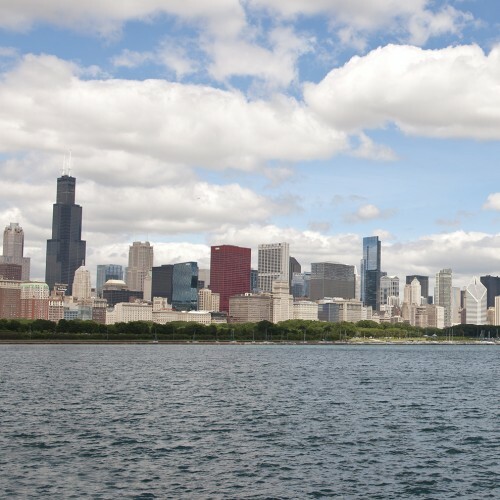 Chicago’s third-tallest building stands out in Chicago’s skyline, distinctively different from its steel-and-glass peers. Its history is rather more colorful than the stark white stone in which it is clad. 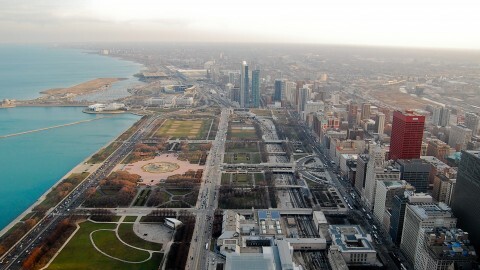 In the late 1960s, the Standard Oil Company of Indiana wanted a consolidated downtown Chicago headquarters. 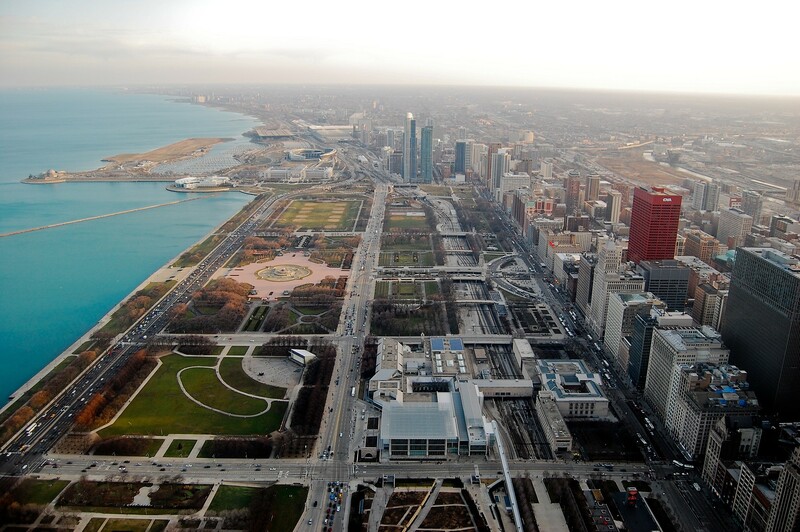 With a prominent site at the head of Grant Park (vacated by industry), their building needed to be monumental. The company hired Edward Durell Stone, whose unique brand of Modernism was then in vogue; his Kennedy Center would open in Washington, DC, in 1971. 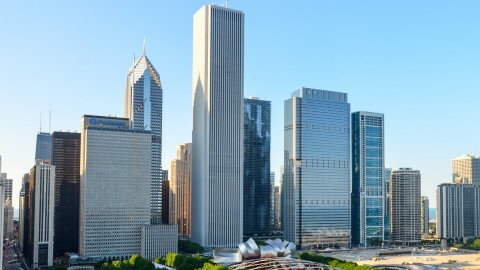 When the tower opened in 1973, it was the second-tallest building in Chicago and the world. 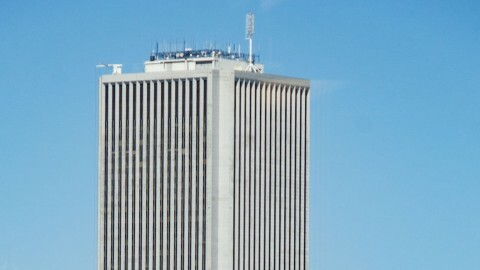 Aon Center, Chicago's third-tallest building, is a vertically pinstriped, soaring white rectangle that reflects its own origins as a corporate headquarters. It is both strong and elegant in its simplicity. 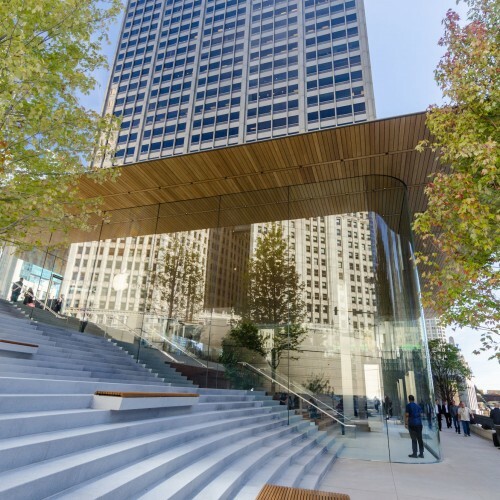 Architects of record Perkins + Will used a relatively new structural form for the tower. Elevators and other services are bundled together in the core, while the perimeter columns define an outer tube. The inner and outer tubes are linked by trusses that support the large open floor plates, and the entire arrangement provides the structure that keeps the building standing. 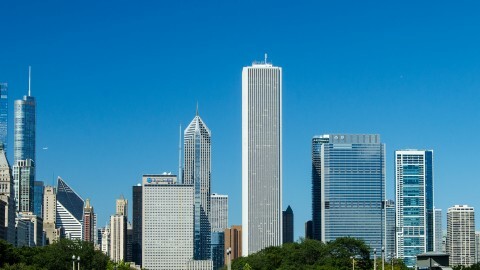 A related tube-based structure was used in the Willis (Sears) Tower, under construction at the same time. 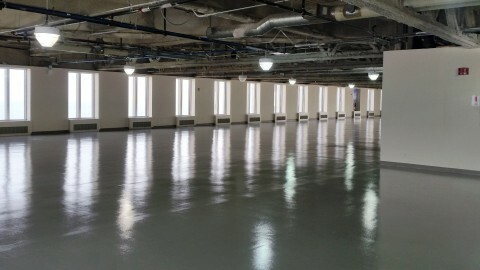 Replacing the Carrara marble with granite may have cost as much as half of the original construction cost for the entire building. 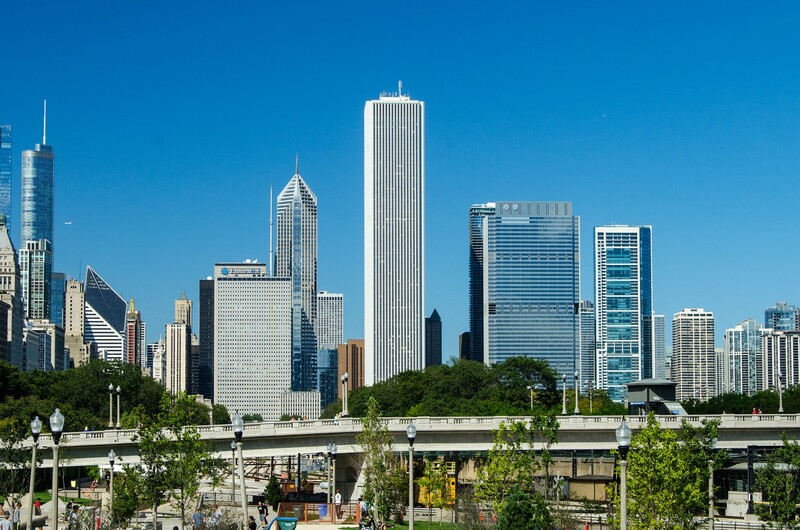 Aon Center occupies only a quarter of its lot, with the rest taken up by a two-level landscaped plaza including fountains and trees. 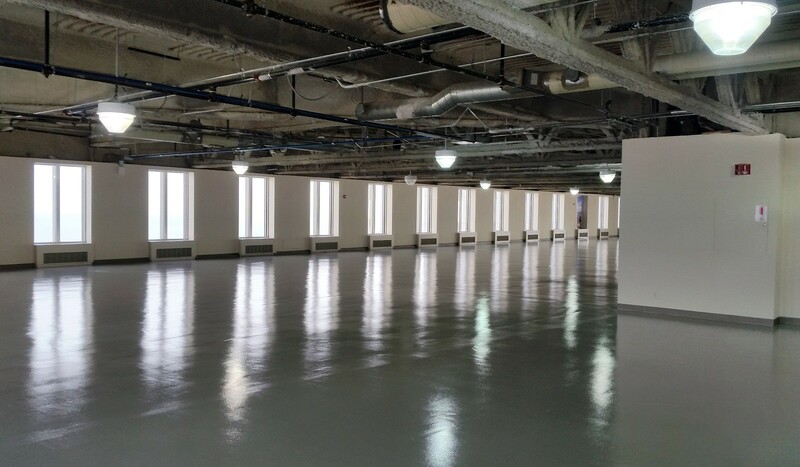 The Carrara marble originally used on the building was recycled in a number of ways—as trophies for staff awards and as landscaping for an Amoco refinery in Whiting, Indiana. First Canadian Place in Toronto is a nearly identical building by Edward Durell Stone, the only visible difference being that the windows are grouped in horizontal bands rather than vertically between visible columns. Standard Oil became Amoco in 1985, and the building rebranded too. 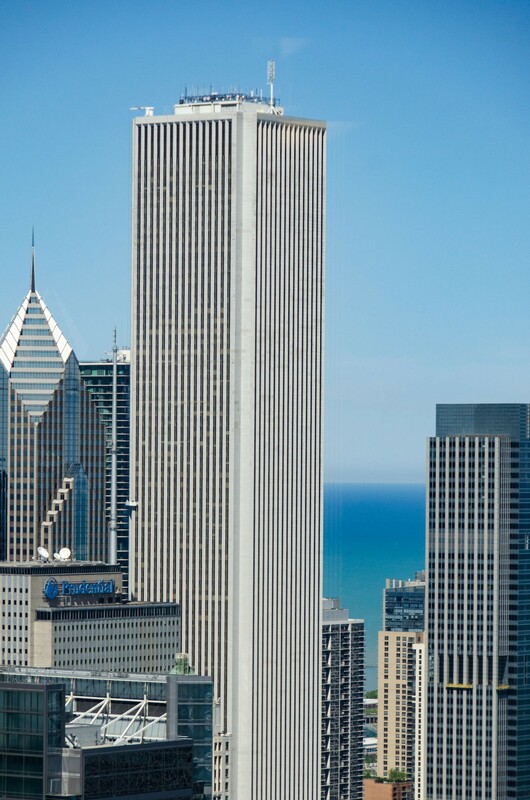 Another name-change arrived in 1998, when the building was sold and renamed Aon Center after one of its major tenants. 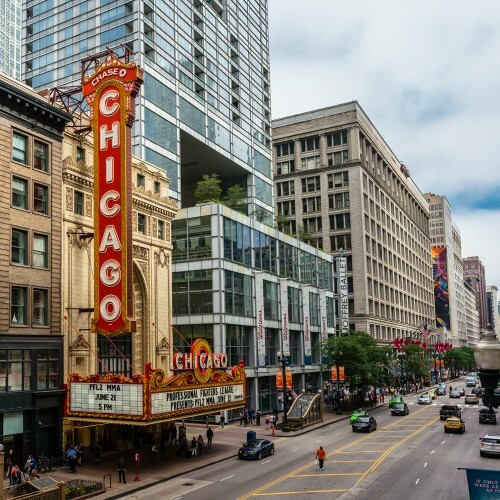 Perhaps its several names have helped prevent the building from gaining quite the same iconic status as Chicago’s other tall buildings. 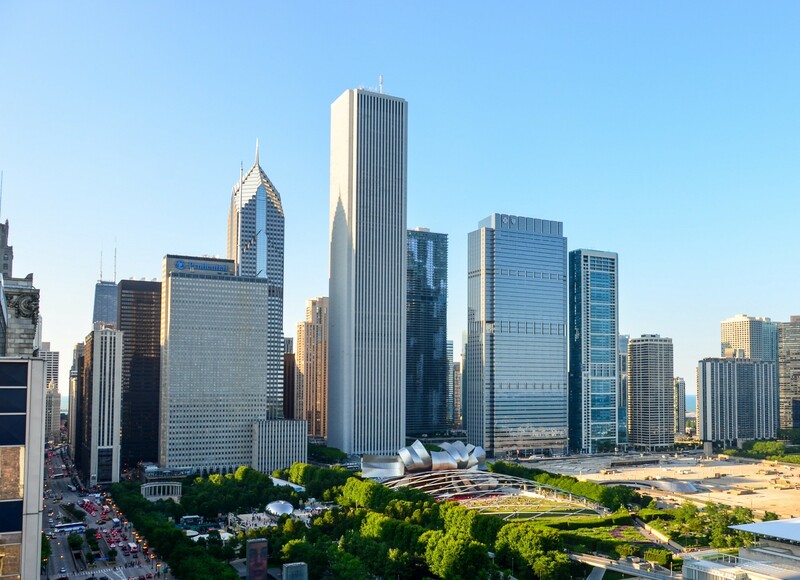 Nonetheless, even as newer structures have sprouted nearby, Aon Center remains a timeless and elegant piece of Modernist architecture that graces Chicago’s skyline. The architect originally clad the building’s numerous columns in white Carrara marble, the same stone used by famous sculptors for centuries. The material was beautiful, but stood up poorly to the wild temperature swings of Chicago weather. 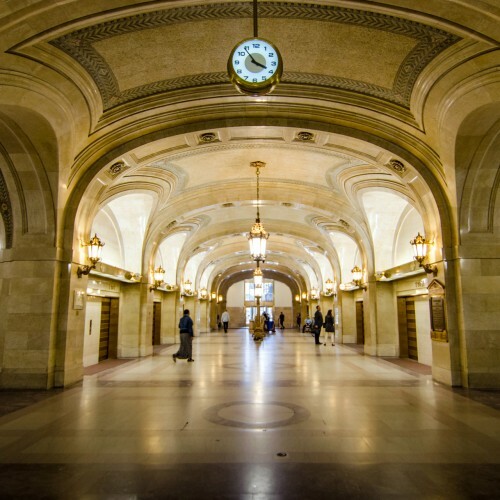 Cracks eventually formed, and in the early 1990s the entire building was re-faced with much more durable granite—at tremendous cost.